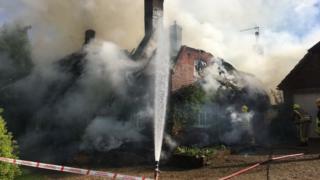 A fire has gutted a large thatched house in the New Forest. The blaze broke out in the rural detached property in The Common, Damerham, shortly before 16:30 BST on Sunday. It took more than 80 firefighters from Hampshire and Dorset Fire and Rescue Services more than eight hours to bring it under control. Fire crews remain at the scene dealing with hot spots. The cause of the fire is not yet known. Hampshire Fire and Rescue said the no-one was hurt in the blaze.